Go east approximately 10 miles to the Thomas Shave Bridge at Intercoastal Waterway. At the first traffic light after the bridge, turn right. Continue for approximately 3 miles (staying straight) to the traffic light. At the traffic light, turn right on South Fletcher Avenue. Our office is approximately 1/2 mile on the right (5299 South Fletcher Ave). 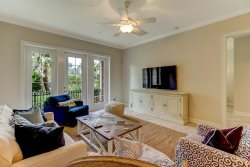 From our Amelia Rentals office, you will receive directions to your Amelia Island or Amelia Island Plantation rental vacation rental property. WE LOOK FORWARD TO HOSTING YOU IN OUR BEAUTIFUL AMELIA ISLAND CONDOS & HOMES!!!! Keys are to be picked up at our office. If you arrive after 5:00 pm, everything you need will be placed in our lockbox. The lockbox is located at the corner of our building, on the front walk. To open the lockbox: Line up the code (we provided you). Press the top and bottom of the lock together and it will pop open. To close the lockbox: Turn the numbers so the code is no longer lined up (If you leave the code in place and try to close the lock, it will not shut), and then close the lock.